Domovoy (“[he] of the house”) is a house spirit in Slavic folklore. It is a masculine, typically small, bearded, and sometimes covered in hair all over. According to some traditions, domovye take on the appearance of current or former owners of the house and have a grey beard, sometimes with tails or little horns. The protector of the house. Every home had its own domovoe who dwelled behind the oven and who might abandon the house if he was not properly honored. The Domovois protected not only the human inhabitants of the house but their herds and household animals as well. In some areas the Slavs believed that prosperity and well-being could not exist in a new house until the head of the family died and became its guardian spirit. 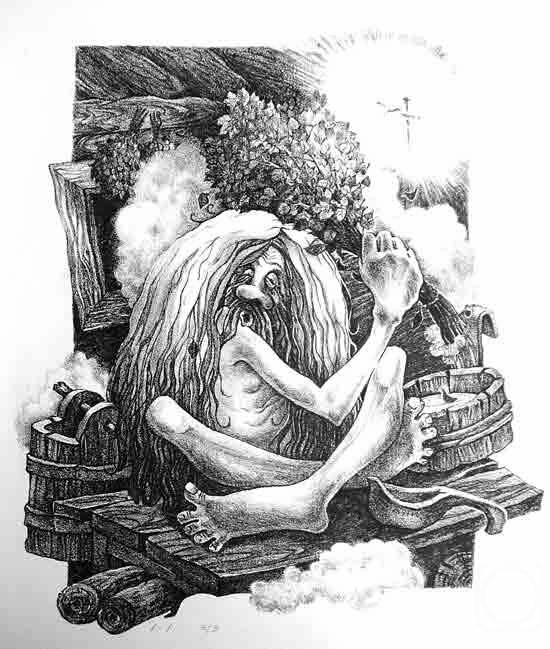 Bannik is the bathhouse (banya) spirit in Slavic mythology. Slavic bathhouses resemble saunas, with an inner steaming room and an outer changing room. A place where women gave birth and practiced divinations, the bathhouse was strongly endowed with vital forces. The third firing (or fourth, depending on tradition) was reserved for the Bannik, and, given his inclination to invite demons and forest spirits to share his bath, no Christian images were allowed lest they offend the occupants. If disturbed by an intruder while washing, the Bannik might pour boiling water over him, or even strangle him. The Bannik had the ability to predict the future. One consulted him by standing with one’s back exposed in the half-open door of the bath. The Bannik would gently stroke one’s back if all boded well; but if trouble lay ahead, he would strike with his claws. 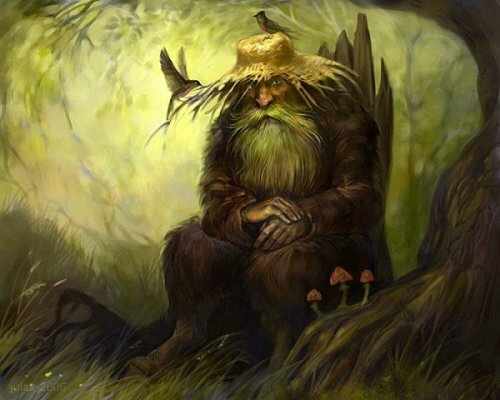 The Leshy or Lesovik is a male woodland spirit in Slavic mythology who protects wild animals and forests. Leshy is the protector of all animals and birds in the forest. Mass migration of animals supposedly happens at leshy’s instruction. He is said to have the ability to shapeshift into any form, animal or plant. When he is in human form, he looks like a common peasant, except that his eyes glow and his shoes are on backwards. In some tales, he appears to visitors as a large talking mushroom. If a person befriends a leshy, the latter will teach them the secrets of magic. Farmers and shepherds would make pacts with the leshy to protect their crops and sheep. The leshy has many tricks, including leading peasants astray, making them sick, or tickling them to death. They are also known to hide the axes of woodcutters. If a leshy crosses the path of a person in the woods, the person will get lost immediately. To find the way out, you have to turn your clothes inside out and wear shoes on opposite feet. Leshies are terribly mischievous beings: they have horrible cries, and can imitate voices of people familiar to wanderers and lure them back to their caves, where the leshies will tickle them to death; they also remove signs from their posts. Leshies aren’t evil: although they enjoy misguiding humans and kidnapping young women, they are also known to keep grazing cattle from wandering too far into the forests and getting lost. If more than one leshy inhabits a forest, they will fight for territorial rights. The evidence is in the fallen trees scattered about and scared animals. 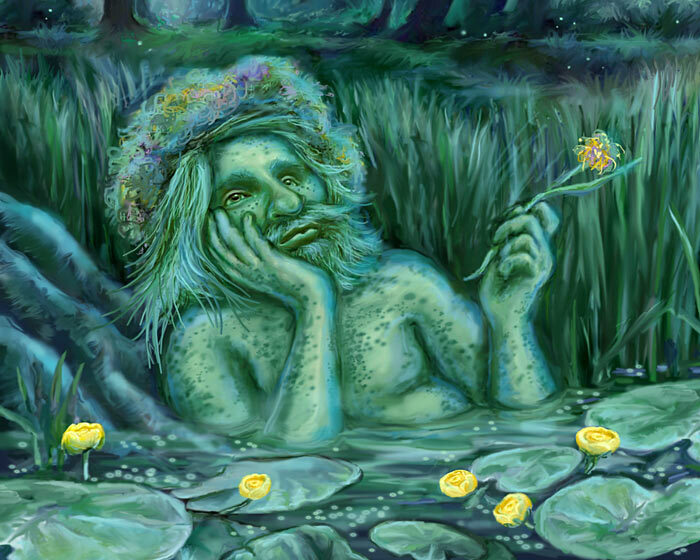 Vodianoy is said to appear as a naked old man with a greenish beard and long hair, with his body covered in algae and muck, usually covered in black fish scales. He has webbed paws instead of hands, a fish’s tail, eyes that burn like red-hot coals. He usually rides along his river on a half-sunk log, making loud splashes. Consequently, he is often dubbed “grandfather” or “forefather” by the local people. Local drownings are said to be the work of the vodyanoy (or rusalkas). When angered, the vodyanoy breaks dams, washes down water mills, and drowns people and animals. (Consequently, fishermen, millers, and also bee-keepers make sacrifices to appease him.) He would drag down people to his underwater dwelling to serve him as slaves. Rysalka. 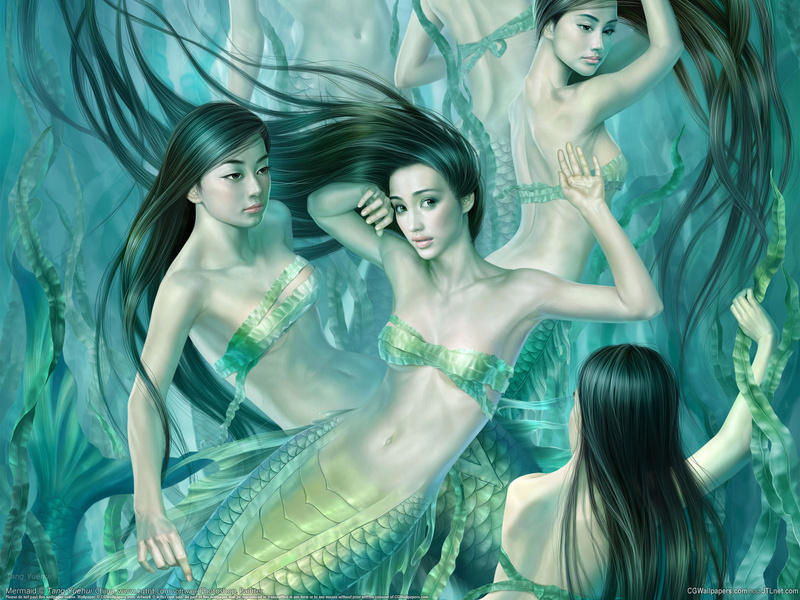 In Slavic mythology, a rusalka was a female ghost, water nymph, succubus, or mermaid-like demon that dwelled in a waterway. In most versions, the rusalka is an unquiet dead being, associated with the “unclean force.” According to Zelenin, people who die violently and before their time, such as young women who commit suicide because they have been jilted by their lovers, or unmarried women who are pregnant, must live out their designated time on earth as a spirit. 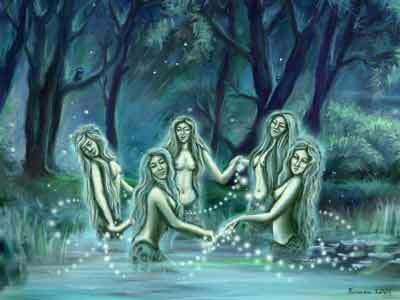 While her primary dwelling place was the body of water in which she died, the rusalka could come out of the water at night, climb a tree, and sit there singing songs, sit on a dock and comb her hair, or join other rusalki in dances in the field. Rusalki like to have men and children join in their games. They can do so by enticing men with their singing and then drowning them, while the children were often lured with baskets of fruit. Men seduced by a rusalka could die in her arms, and in some versions hearing her laugh could also cause death. Alternatively, they would attract men, mainly bachelors, and tickle them to death.